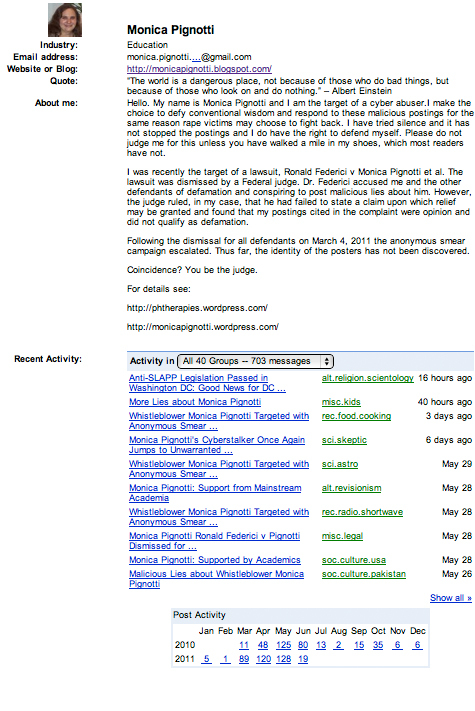 Monica Pignotti must be bored. Recently, she posted material about Russian adoptions taken from a website operated by Larry Sarner. Not only did Pignotti add nothing new to this, but she also admits to having parted company with Sarner’s organization in 2010. Monica Pignotti describes herself as the “Ralph Nader of Psychotherapy” and claims to be a child advocate. She seems to spend a great deal of time posting to the Internet, in Usenet discussion groups. Her activity seems to be on an upswing in 2011, as she has exceeded her numbers for March, April, and May. She seems to post more less the same thing, a rather obsessive account of a lawsuit, to a fantastically diverse of discussion groups. 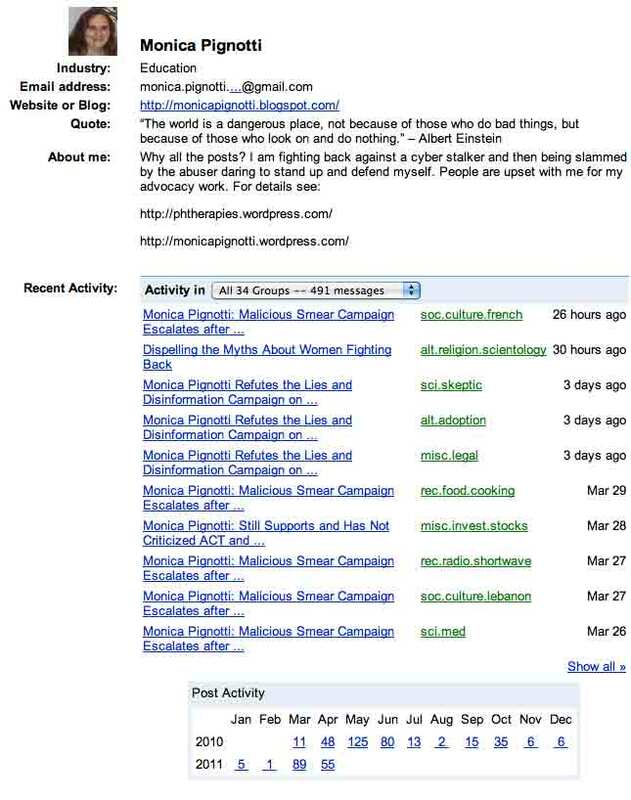 Her topic is largely irrelevant to most of them, for example, she posts to groups about Scientology (she is a former Scientologist, but this court case has nothing to do with Scientology), children, cooking, skepticism, astronomy, revisionism, shortwave radio, law (here her posting may be relevant), the United States, and Pakistan. None of these postings seem, in any way, to further any sort of consumerist mission with regard to psychotherapy, and, with the exception of the posting about SLAPP lawsuits (oddly posted to a Scientology group), it is difficult to discern any course of activism either.